The daunting tasks facing corporate human resource directors throughout the country are just as common among transportation departments. With the projected workforce shortage and the challenges DOTs face to be competitive with private sector, how do transportation departments recruit the best candidates, retain them and plan for future resource needs? Human resource managers in the transportation industry have been asking those questions for several years, explains ITD Human Resource Manager Mary Harker. The new Idaho Driver's Manual will include improved information about bicyclists and motorists safely sharing the highway when it is released later this summer. Enhancement of the "Share the Road" chapter in the Idaho Driver's Manual is the result of collaboration among state Sen. Elliot Werk, statewide bicycle advocates and ITD. Auto body repair shops in the Boise area apparently rely less on repeat customers than new ones – or so suggests a report issued this week by Allstate Insurance Company of Northbrook, Ill. Allstate America’s Best Drivers Report” indicates that Boise car owners average about 11.8 years between collisions, which ranks them ninth, along with Colorado Springs, Colo., in the nation’s top 10. While Idaho law enforcement’s summer impaired driving mobilization continues through July 12, ITD statistics show that more impaired drivers were arrested during law enforcement’s last mobilization, March8-22. Statewide, law enforcement officers from 55 agencies made 459 driving-under-the influence (DUI) arrests during the 14-day period. Nearly 300 police cars will make the trip from the ITD maintenance facility at Council to New Meadows on U.S. 95 Tuesday afternoon in tribute to fallen Adam's County Sheriff's deputy Leroy Matthews. Mobile communication devices, including “smart phones,” have simplified the way state employees perform their work. But at the same time, they have opened the door for unscrupulous hackers to secretly track and intercept information and spread malicious software. A little bit of humor can go a long way; a little creativity also can go along way. Combine the two and you can go even farther – from artist to criminal. 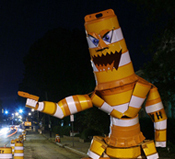 A 21-year-old North Carolina man recently created an eye-catching sculpture by reshaping construction barrels and putting them back on the side of the highway in a construction zone. Youths from throughout Idaho and one from Singapore had an opportunity to explore aviation from the ground up… and from the clouds down this week during the annual Aviation Career Exploration (ACE) Academy in Boise. Changes that became effective Wednesday (July 1) in the registration and titling of motor vehicles are expected to improve customer convenience, law enforcement efforts and record keeping. Beginning Wednesday, individuals registering a motor vehicle in Idaho or seeking a vehicle title will need to provide a full legal name, along with either a driver's license number or Idaho-issued identification card. A verifiable physical address and mailing addresses also will be required. District 1 is reaping unexpected benefits from a summer youth employment program sponsored by the Idaho Department of Labor. The program was made possible through the federal stimulus money from the American Recovery and Reinvestment Act. It could prove to be a long, hot summer for ITD employees in Coeur d’Alene. District 1 Business Manager Scotty Fellom announced this week a major renovation will begin Tuesday on the heating, ventilation and air conditioning system at the Coeur d’Alene office. Installation of new equipment will displace many workers, on a rotating basis. The emerging world of social media is opening new opportunities for government agencies to send important information directly and efficiently to the public. For ITD, notices of road closures, lane restrictions and construction zones are at the forefront of its decision to launch a pilot program using Twitter, the social networking and messaging medium that sends and receives instant 140-character messages via the Twitter Web site or by way of web-capable cellular phones.